proteins, accounting for up to 2% of plant tissue dry weight. revert to toxic ammonia in aquaria with pH over 7.0; urea is a source of ammonia). Nitrogen is required by plants in the largest amounts of the three major (macro) nutrients: nitrogen, phosphorus, and potassium. Nitrogen is a part of all living cells and is a requisite of the metabolic processes in which proteins, amino acids, coenzymes, and nucleic acids are created. It is an integral part of chlorophyll manufacture through photosynthesis, the process in which light energy is utilized to convert carbon dioxide into carbohydrates, which is in turn used to provide the energy for growth and development. A percentage of the nitrogen in aquaria is contributed as ammonia and ammonium, components of fish waste and the decomposition of nitrogen-bearing molecules, such as latent dissolved and particulate organic material; however this is not always sufficient to meet the nitrogen requirements posed by plants. Particularly in heavily-planted aquaria with intense lighting, CO2 supplementation, and/or a minimal stocking of fish, nitrogen can become a limiting nutrient in plant growth; in extreme cases, it can lead to chlorosis, in which the leaves become pale (particularly on older foliage, which tend to be on the periphery). Nitrogen deficiency tends to cause new leaves to be smaller and paler than normal and overall plant growth to be stunted. 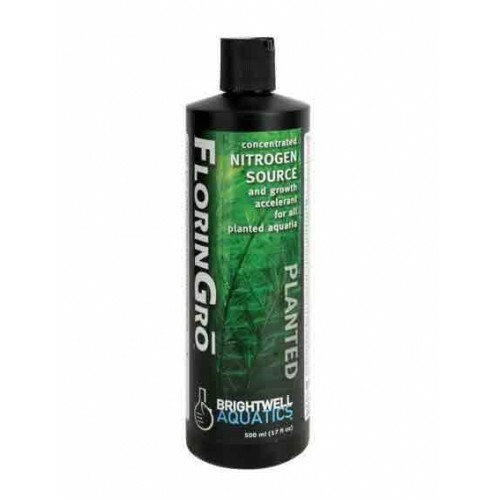 The source of nitrogen utilized in FlorinGro is derived from nitrate compounds. 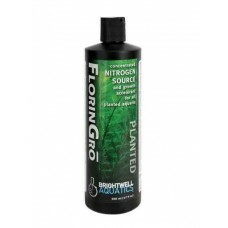 While plants unquestionably make use of ammonium and the constituents of urea very effectively, our experience and extensive research dictate that these compounds be excluded from FlorinGro as a result of the clear danger they pose to fishes and other non-plant aquarium inhabitants when aquarium pH is greater than 7.0; we feel that these nitrogen sources are useful to aquatic botanists and horticulturists, but that they are not suited to use in an aquarium. Nitrogen should primarily be present as nitrate and maintained at a concentration of less than 20 ppm. In addition to nitrogen, magnesium, iron, and potassium are important to chlorophyll production. Maintaining a total iron concentration of 0.05 - 0.10 ppm, magnesium concentration of ~5 ppm, and potassium concentration of 15 - 30 ppm, is recommended. Shake product well before using. The most effective method of using any ion-specific supplement is to determine the ionic concentration in the aquarium prior to supplementing. Maintain the nitrate concentration within a range of 10 - 20 ppm; it is not recommended to exceed 25 ppm nitrate in planted aquaria housing fishes and invertebrates. Basic: Add 5 ml (1 capful) of product per 50 US-gallons (189.3 L) of aquarium water every other day or as required; this corresponds to 1 ml (~8 drops) per 10 US-gallons (37.9 L). When used in this fashion, 250 ml treats up to 2,500 US-gallons (9,464 L).